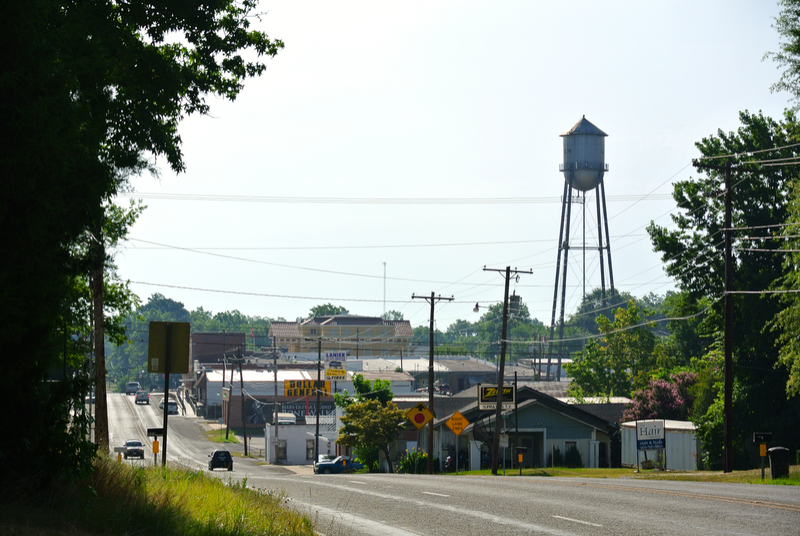 Leaving New Boston behind, headed south, we passed through the even smaller community of Old Boston, a small dot on the map nestled in the East Texas pines. Further to the south, we switched highways in the small town of Maud, and soon passed over Wright Patman Lake, near the Bowie-Cass county line. In the early morning, only one boater could be seen on this lily pad-covered body of water. South of the lake is the small town of Linden, the seat of Cass County. The courthouse here was semi-recently restored. I can remember first visiting this courthouse while it was under restoration. This is, in my opinion, one of the THC’s most important courthouse projects. 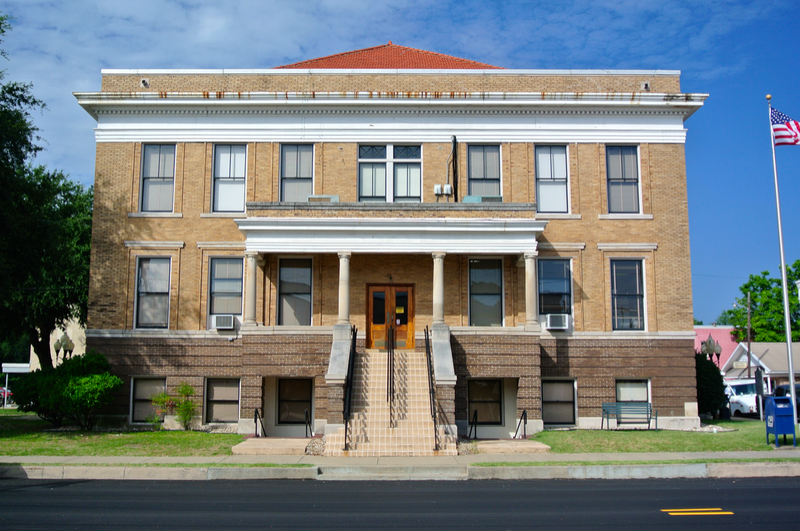 That’s because this is the only remaining functioning courthouse dating from the antebellum period left in Texas. That means it was constructed prior to the Civil War. 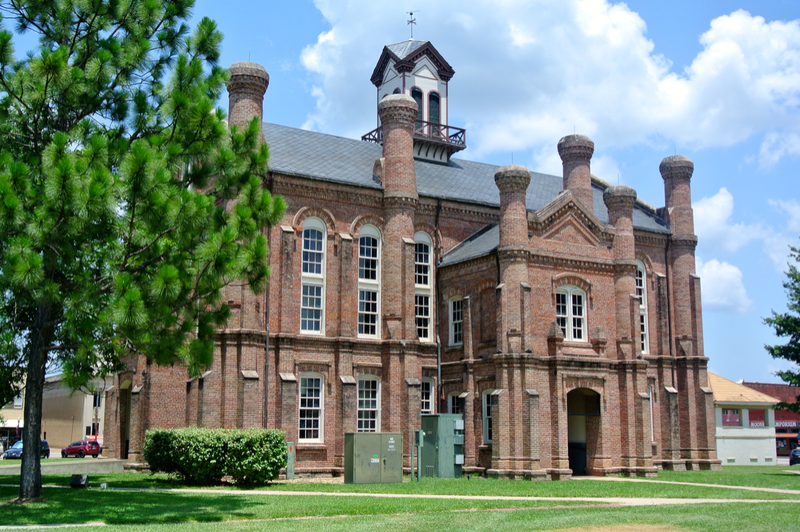 Without a doubt, it is the oldest functioning courthouse in the state, antebellum or otherwise. Only very few courthouses remain older that it, though their purposes no longer exist. As we entered Linden, the courthouse was the first thing to grab our eyes. I certainly wouldn’t guess its age just by looking at it. The THC’s work here has done Cass County a great service in preserving this beautiful building. While touring the courthouse interior, I came across a plaque commemorating two of the major benefactors responsible for funding in the restoration project. One I wasn’t familiar with, but the other I was. Singer Don Henley, of the band, Eagles fame, was born in nearby Gilmer, and grew up in Linden. He was kind enough to remember his home county in their restoration effort. Interesting. 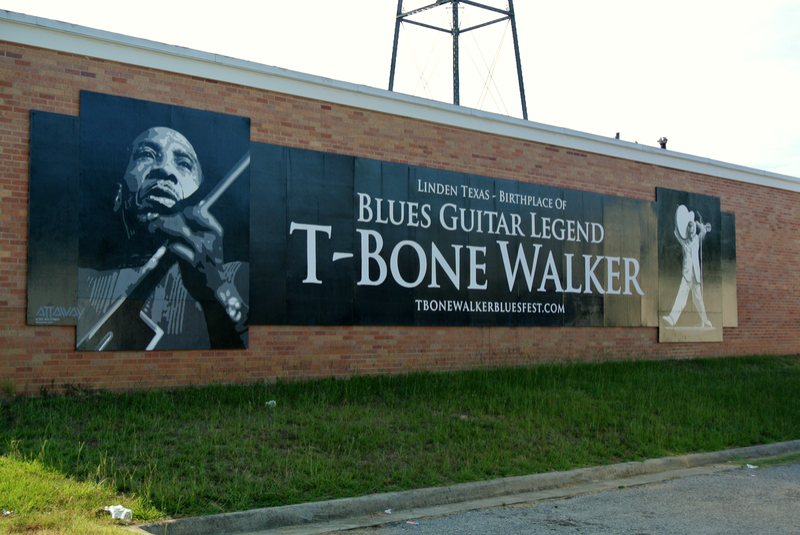 With such native sons as Don Henley and T. Bone Walker, it’s easy to see why Linden is nicknamed, “Music City, Texas”. Our journey continued south, remaining parallel with the Louisiana-Texas state line into Marion County. 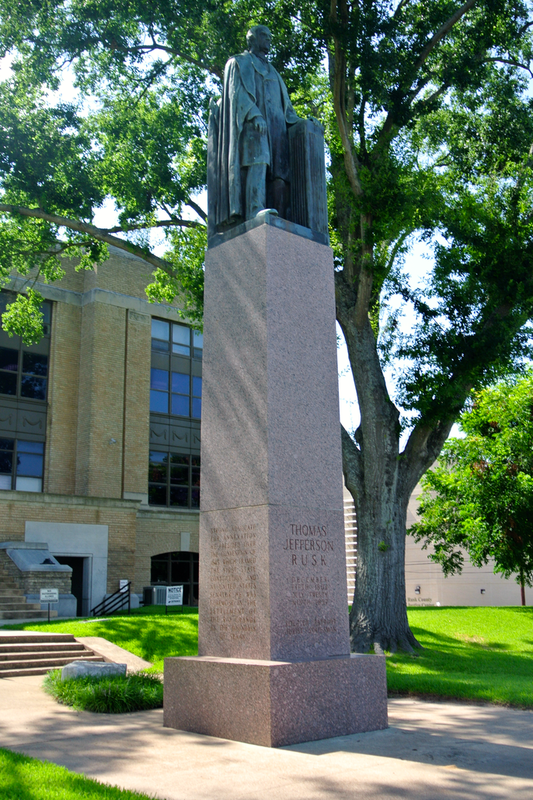 The county seat of Jefferson, named to honor the United States’ third president, is considered to be the fifth-oldest town in Texas. 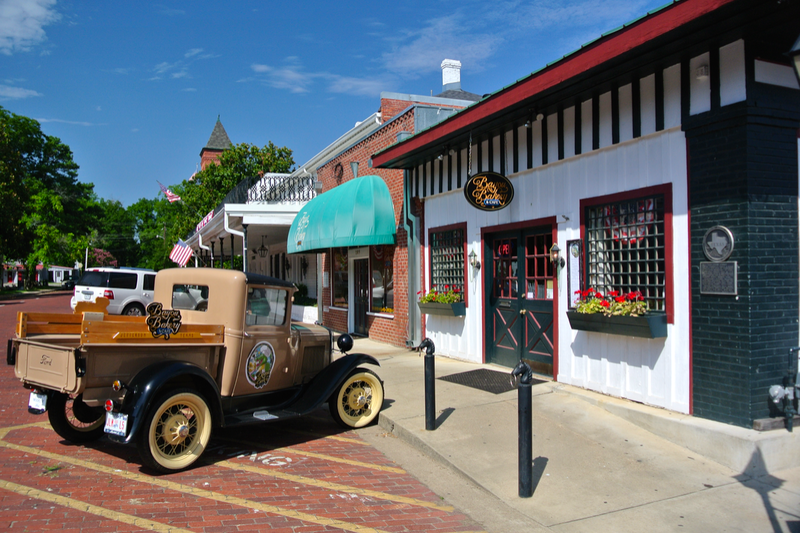 It also claims to have the largest collection of historic structures of any city in the state. From what I can only assume is the Chamber of Commerce’s website: “The rich and diverse history of Jefferson, Texas is told through numerous factual and romantic accounts, including those that describe its dramatic rise to prosperity during the mid 1800′s, as the states’ largest and most significant riverport. This period of prosperity has come to be known as “The Golden Era”. Jefferson erupted into a mid-19th-century boomtown with the help of a genteel, graceful society of successful and well-bred families, a host of nefarious opportunists and a rich assortment of eclectic individuals, while offering a supply point and doorway to settlers and immigrants looking for a new life. 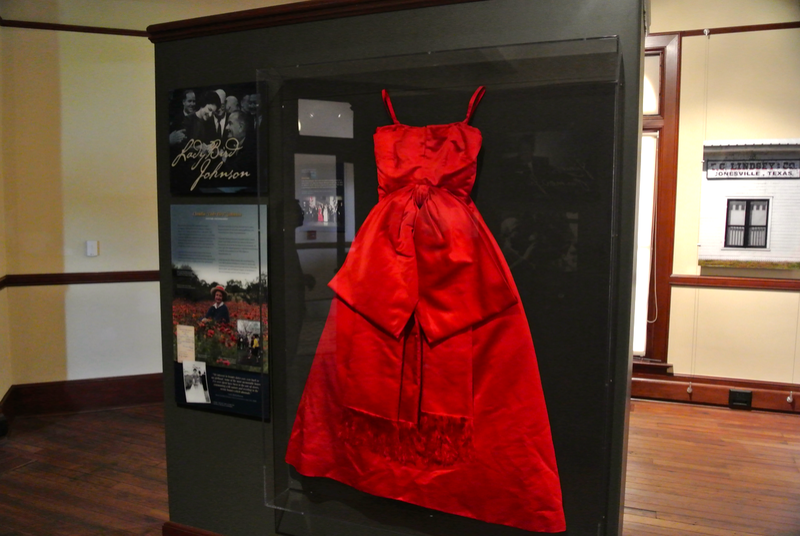 She was and remains, The Queen of the Bayou.” You can read more about the history of Jefferson here. 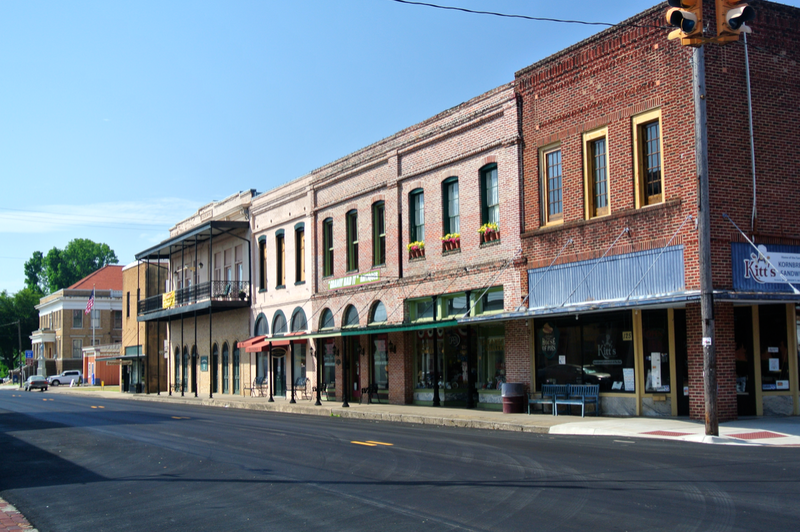 Jefferson was, at a time, the sixth largest city in Texas due to its economic strength in ferry traffic along neighboring Big Cypress Bayou. In the first half of the twentieth century, a natural log jam that had dammed the bayou for so long was removed by the government. It ceased to exist, along with Jefferson’s success. Subsequently, the “Golden Era”, as it was called, received the same fate. 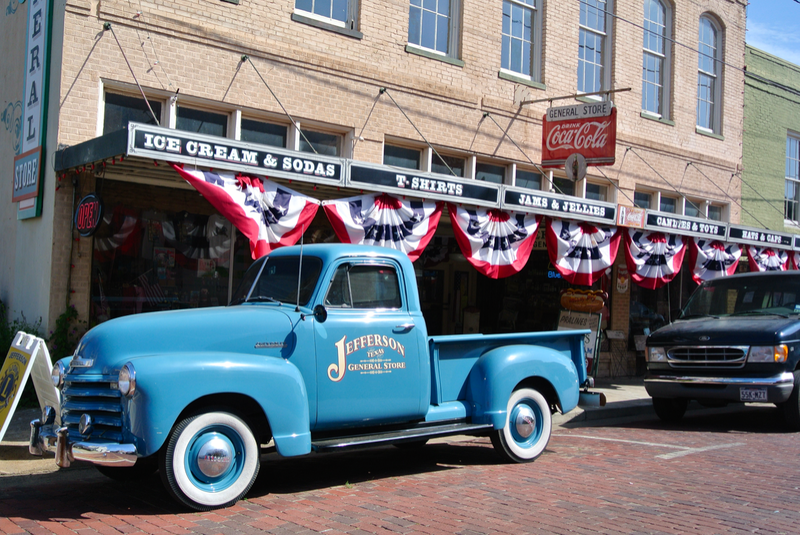 Today, its historic downtown is very interesting to visit. It’s easy to see how this community was once a “bayou town”. The Louisiana, or should I say, New Orleans, influences in some of the architecture are hard to miss. 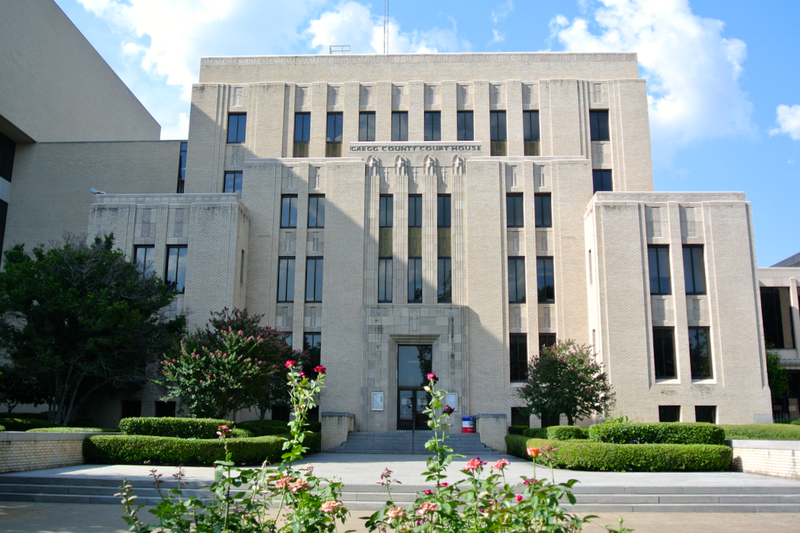 Unfortunately, the 1914 Elmer G. Withers courthouse there, is not as impressive as the rest of the city’s buildings. 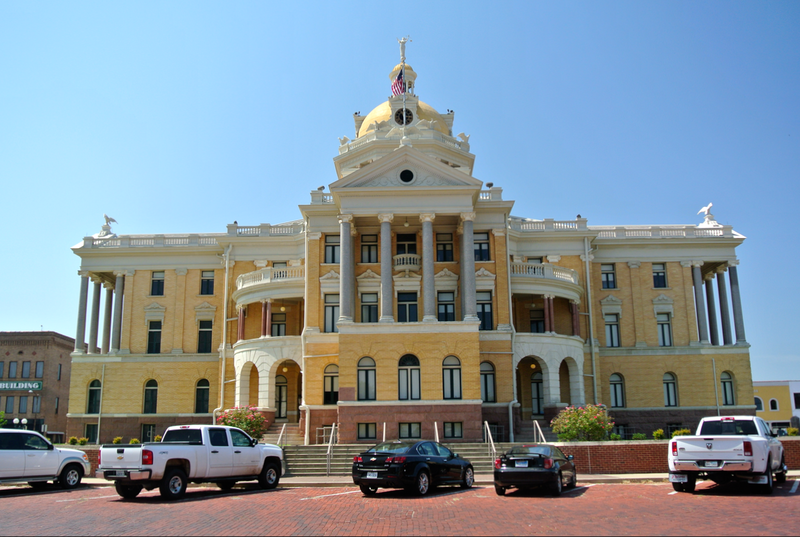 I did realize, though, as soon as we pulled up, that this courthouse bore a striking resemblance to the one in Roberts County, up in the Panhandle. I’d see it for myself nearly two months before. I heard a man inside the courthouse confirm this to my grandfather. The roofs of these courthouses only reinforce my suspicion in their “sister buildings” status. Aside from the courthouse, I was also keen on visiting some of the town’s more historic sites. While I photographed the exterior of the historic Jefferson Hotel, my grandfather spied a bakery across the street that was open. We decided to stop and eat here for a late breakfast/early lunch. After eating the great “brunch” whipped up by Bayou Bakery, we poked our heads into the Jefferson Hotel to photograph the lobby. The front desk receptionist saw what we were doing and was kind enough to give us permission to walk through the rest of the hotel. The next county seat is the city of Marshall, some mere fifteen miles to the south of Jefferson. For a long time I’d anticipated getting to visit the Harrison County courthouse and now I finally got to do just that. 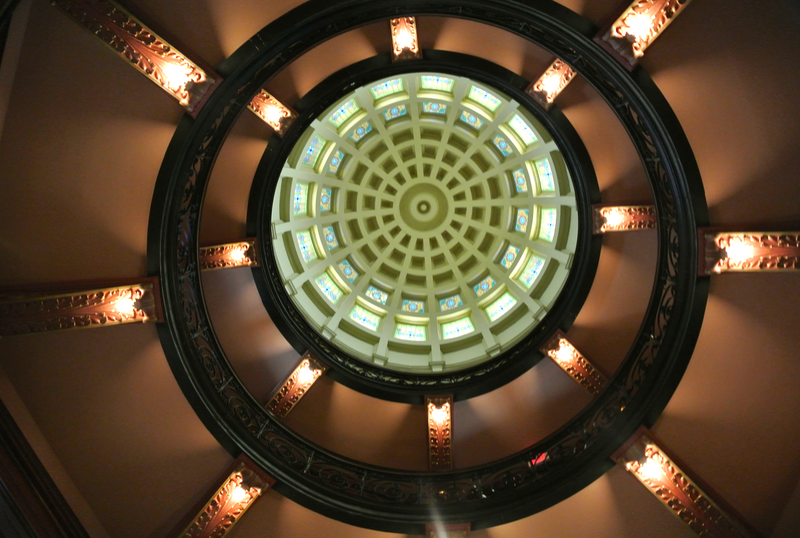 It is by far, one of the most, if not the most impressive courthouse in our whole state. 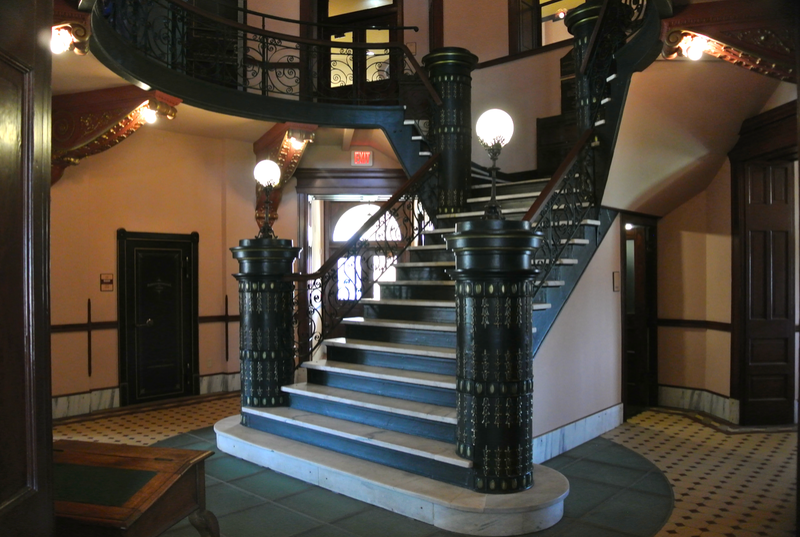 And of course, by those standards, it’s not hard for one to guess that the architect was the master, James Riely Gordon. 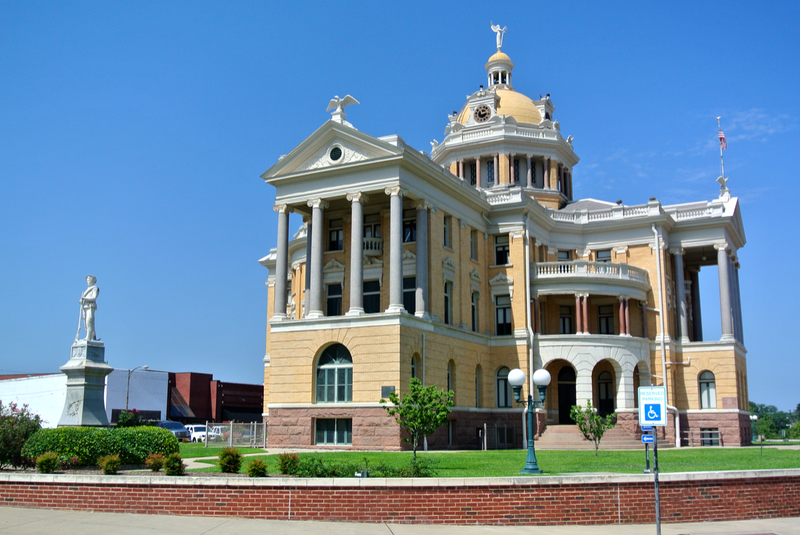 Today, the majority of court functions take place in the current Harrison County courthouse, visible from the historic courthouse square. 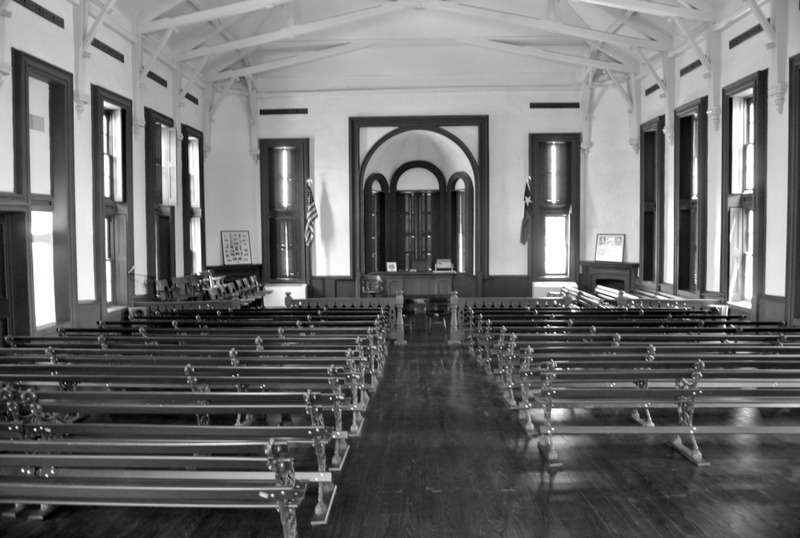 However, commissioners court is still held in the historic courtroom. I know that for a fact, because it is that very thing that kept me from photographing the courtroom upon my visit. 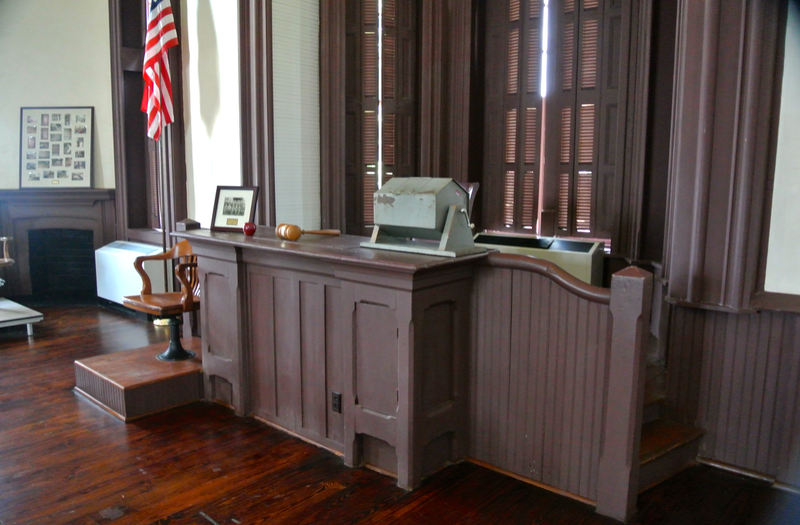 In addition to serving Harrison County by providing office space for both the commissioners and the county judge, the courthouse is also a museum to county history. The interior is breathtaking. While I was photographing it, we ran into a team of custodial staff. They were very kind in allowing us to see a portion of the foundation hidden behind locked doors in the basement and portions of the museum (which was closed at the time of our visit). 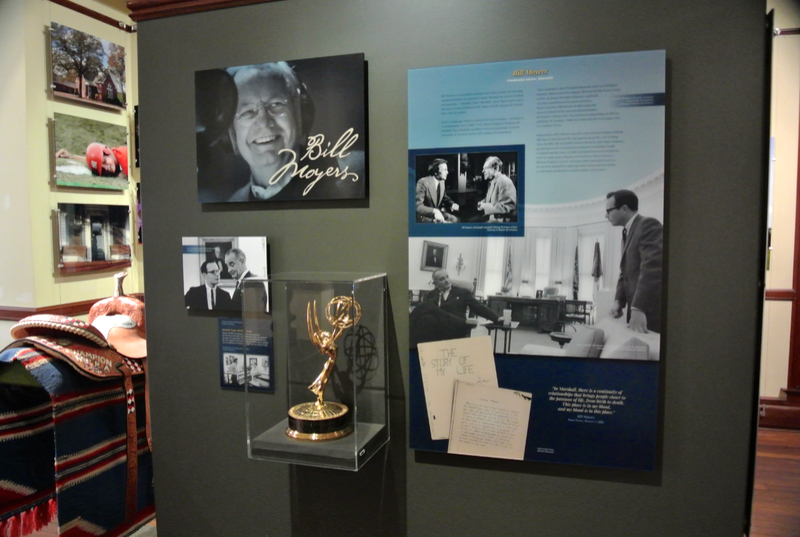 In one room, there were several displays of historical artifacts of famous people from Harrison County. These include Lady Bird Johnson (who was born in the small town of Karnack) and Bill Moyers, Press Secretary under the Johnson administration and news commentator for several more years. Graciously thanking the two that allowed us to see this, we left the courthouse interior and I completed photographing the exterior before we left Marshall. 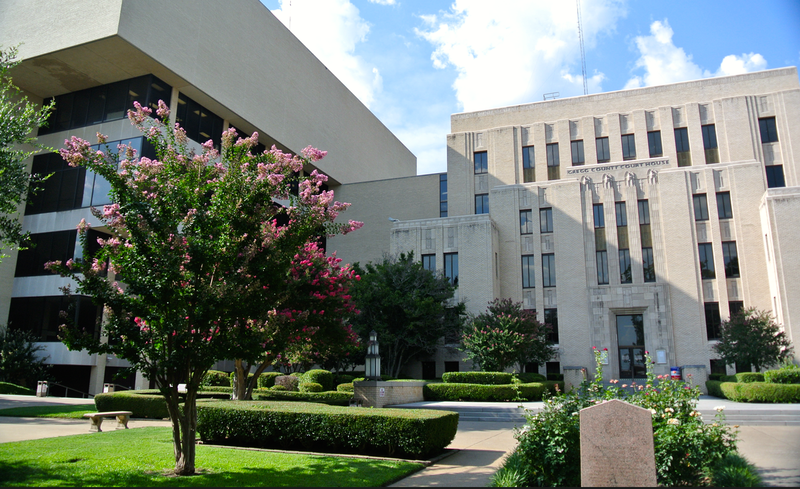 This definitely ranks in the top ten, if not the top five, of my favorite Texas courthouses. What a pleasure it was to see it in person. 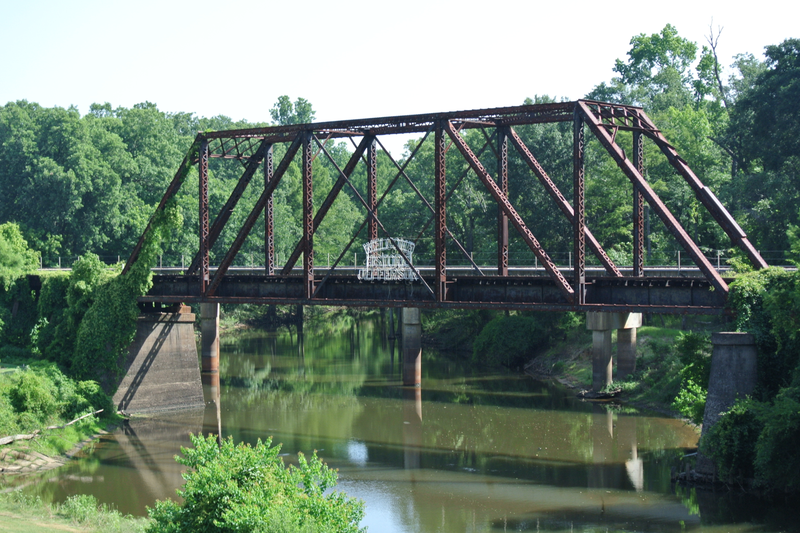 Again, we headed south, parallel to Louisiana, to Panola County. 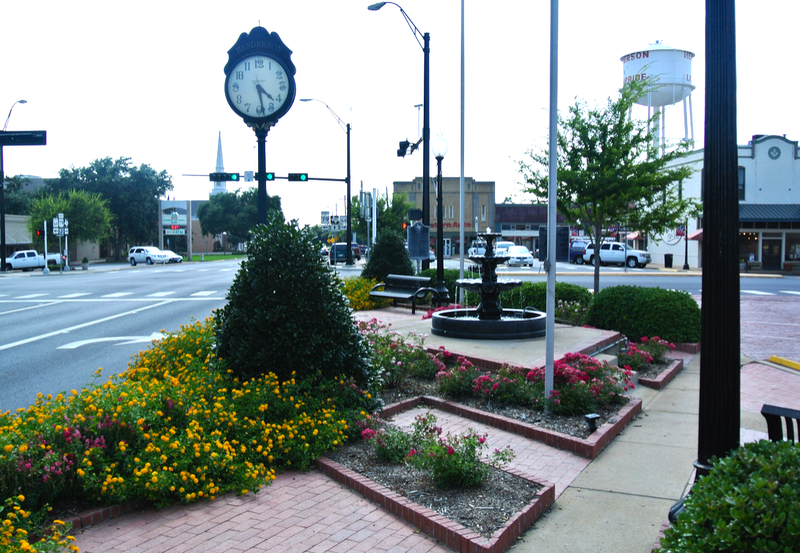 According to a historical marker on the Carthage city square, “panola” was an old Indian word for cotton. As far as I know, this is the only county with a Native American word for a name (other than Comanche, of course, however I’m not positive whether “comanche” is an Indian word or an Anglo word). 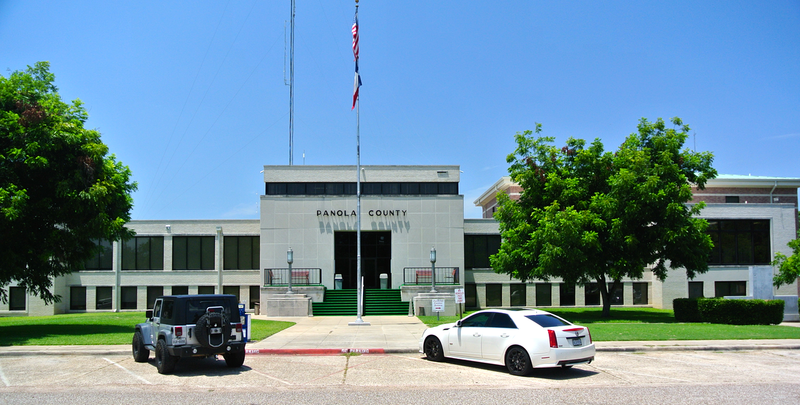 Panola County, like Cass County, also boasts a few musical sons in the music world, most notably the country singers Tex Ritter and Jim Reeves. 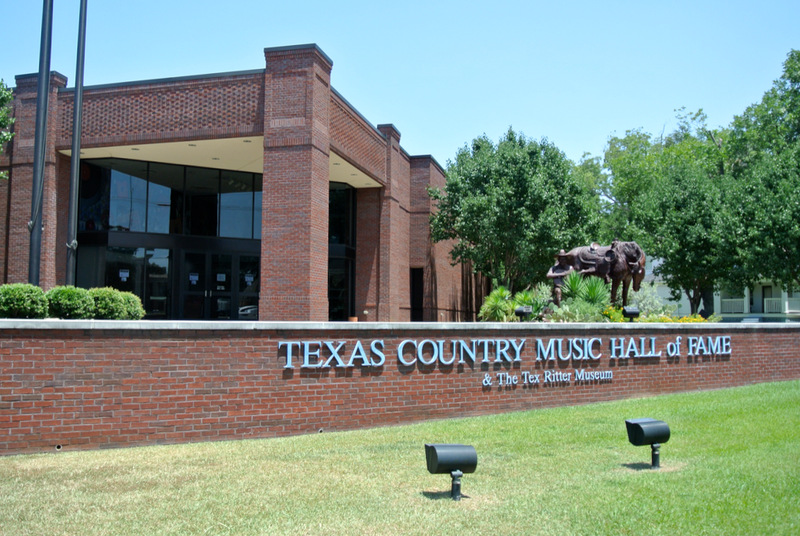 In fact, the Texas Country Music Hall of Fame and Tex Ritter Museum is located in Carthage. I’d been wanting to visit the hall of fame here, but unfortunately it was closed for renovations when I came to Carthage. A trip here will have to wait for the future. The courthouse is just south of the hall of fame, located off the actual square. 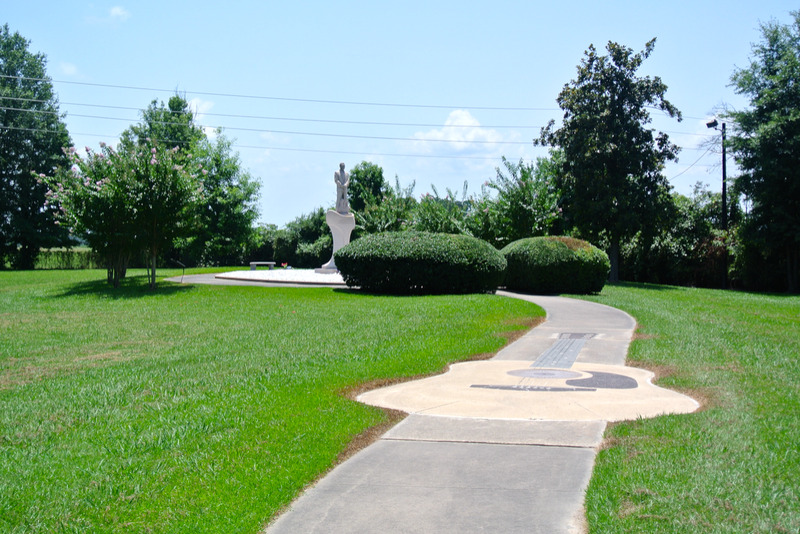 The center of the Carthage square is now a public park area, standing where the original Panola County courthouse once did. The standing structure is “tucked away” from the square, almost as if the county tried to hide it from the eyes of tourists to Carthage. I understand why. I’ve heard this courthouse described as looking like a “TV/radio station”. That’s a pretty accurate description. Although the hall of fame was closed, another country music attraction in the area was not. And I was determined to see it. 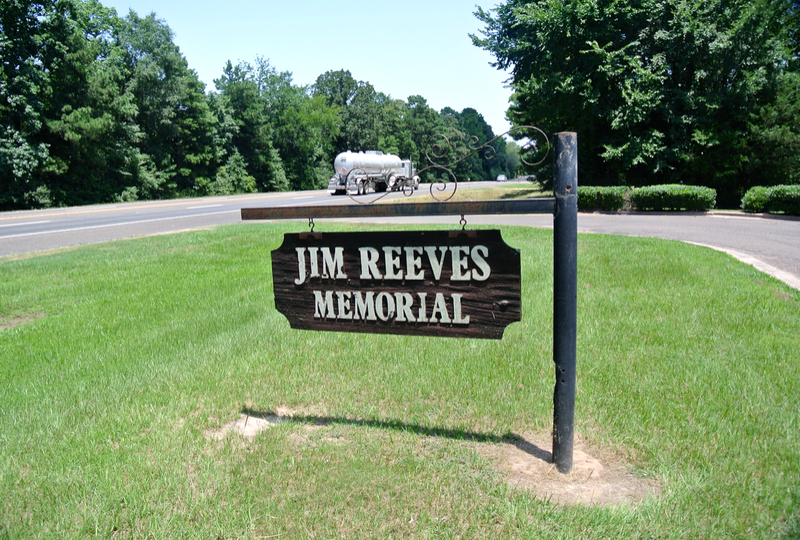 Jim Reeves, known in the country music world as “Gentleman Jim”, known for his crooning ballads and velvety voice, is buried out this way, under an impressive monument. On July 31, 1964 his career came to a tragic end, when he died in a plane crash just south of Nashville. 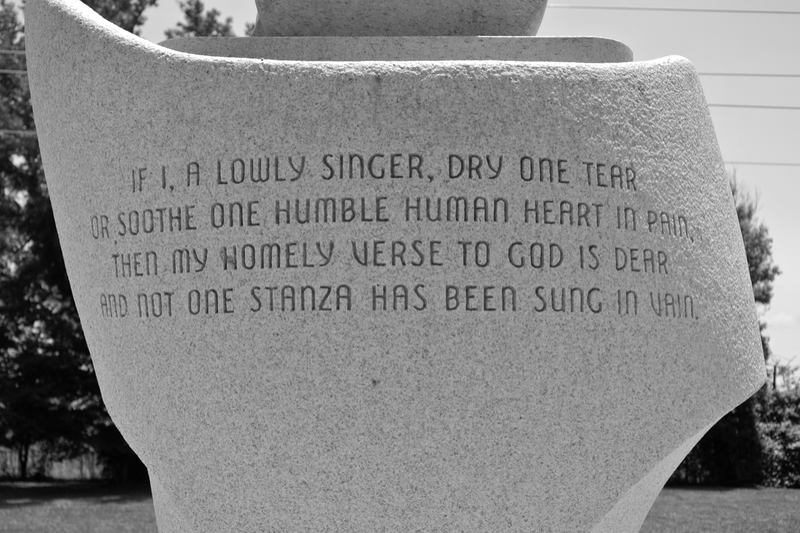 His body was brought back to Texas and his grave became a public memorial to his life and musical career. It’s located some three miles northeast of Carthage, and is open to the public for free. We went here next. With such hits as “He’ll Have to Go”, “Welcome to My World”, and “Four Walls”, Jim Reeves remains a favorite in the classic country genre. 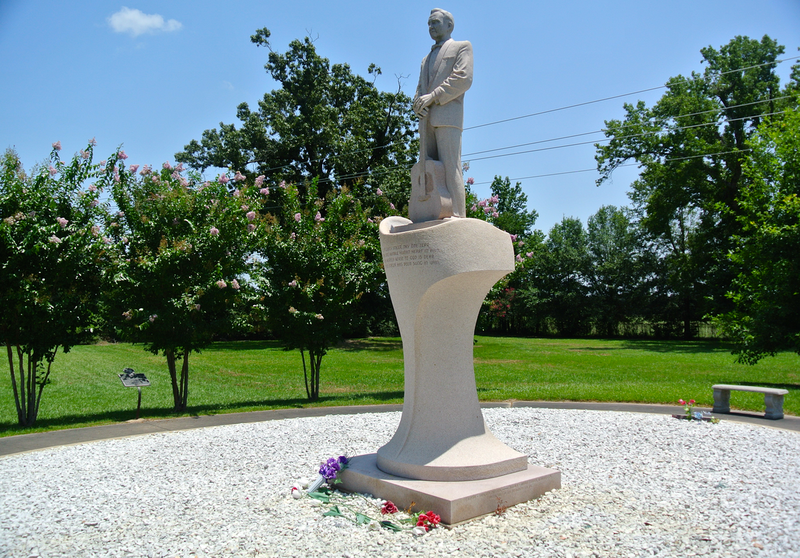 After paying respects to Gentleman Jim, we moved south one last time to Shelby County, the northernmost Texas county that has the Sabine River as its eastern border. The county seat, Center, is located in deep East Texas, making me realize we had long left northeast Texas. I use the name “northeast” for this trip purely for ease. 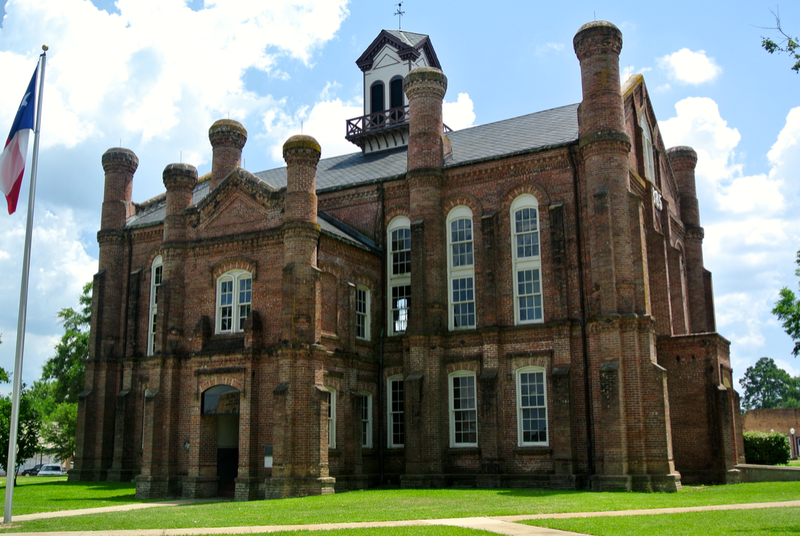 In addition to Harrison County, the Shelby County courthouse was on a list of buildings I had been anticipating to see. It’s a very unique structure, the only of its kind in the state and the country. The architect was an Irishman named, J.J.E. Gibson. He designed two courthouses in the state, one in Panola County and one in Shelby County, but the Shelby County one is all that remains. Because he grew up in Ireland, Gibson wanted his courthouse works to resemble the castles he once saw populating the Irish countryside. This unique building remains the only Irish castle-style court building in the entire United States. 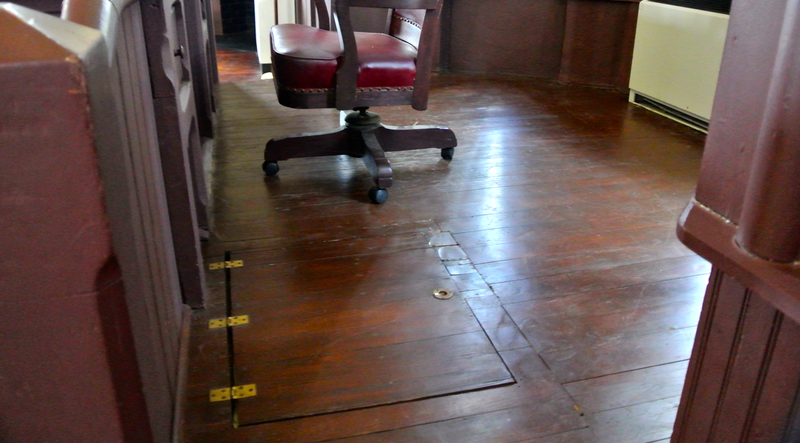 As detailed in Historic Texas Courthouses by Michael Andrews, the historic courtroom in this courthouse contains a trapdoor behind the judge’s seat. I had known this for some time and had been very interested and eager to see it for myself. After arriving on the Center square, I managed to take a few pictures of the exterior, before deciding to head in to the courthouse and worry about finishing the outside shots later. I approached the southwest entrance and pulled on the door, ready to enter this historic building. To my surprise, I found it locked. I was puzzled, but I decided to head around to another side and try that door. As I turned around, I noticed a large building rising over a row of buildings on the Center square. Letters on the side of it read: Shelby County Courthouse. I remembered in horror that the historic Shelby County courthouse had been retired some time ago. No! Fearing that it was closed, I ran around to another side and tried the door. Locked. I’m sure it was quite a sight to see me running around the building frantically, but I was determined not to give up. 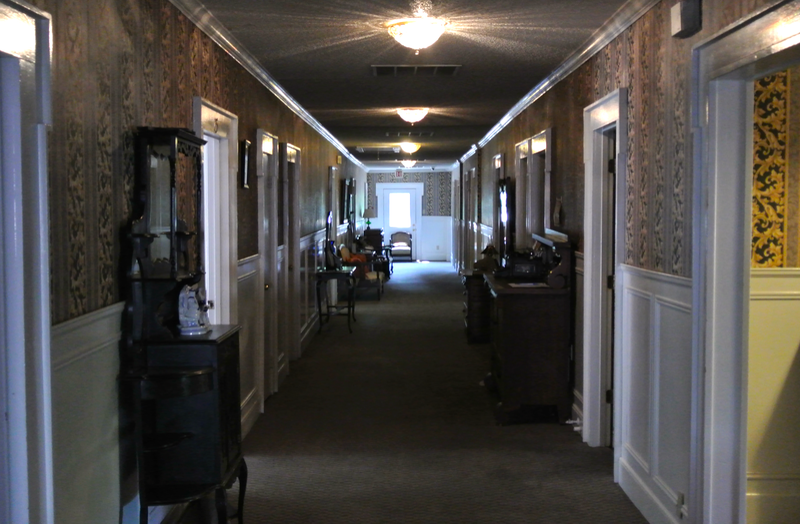 As I approached the northeast entrance, I heard voices coming from inside the building and the sound of a lock turning. I had arrived right as the courthouse was closing. This didn’t make sense to me, as the time we got to Center was around two o’clock that afternoon, three hours before courthouses normally close. We explained to her our circumstance and how we “go around visiting every county courthouse in the state.” Fortunately, my grandfather’s “shpeal” won her over. Slightly defeated she sighed and told us to “come in.” Great news! I was going to get to see the historic courtroom. Well we were two of those people. 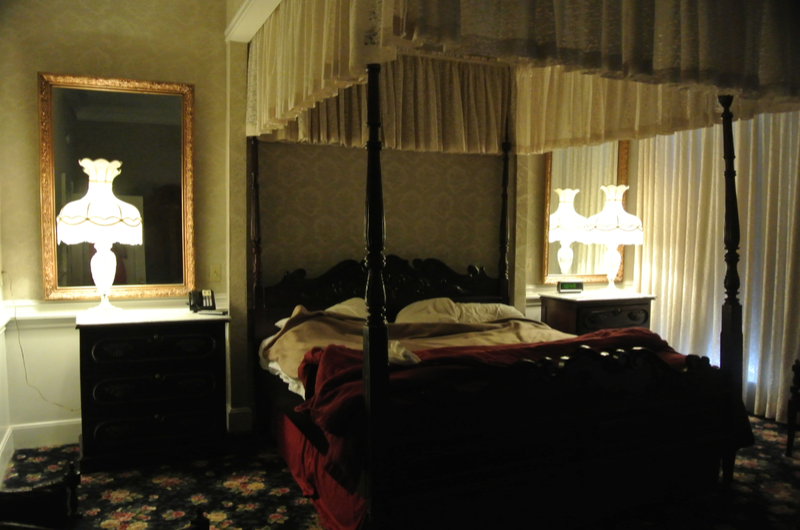 She and Elijah led us upstairs where I finally got to see the courtroom I’d read about. Here is the famed trapdoor. This allowed the judge to escape when situations in the courtroom got hairy. 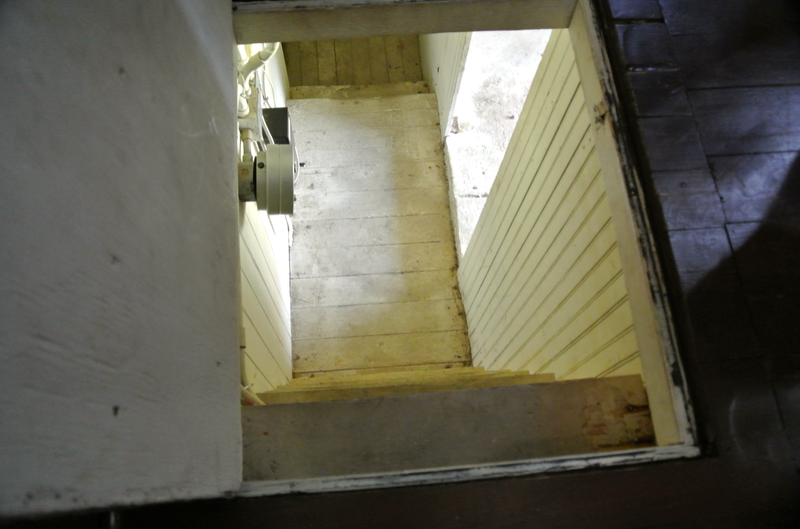 Jo even opened it, revealing a very steep staircase that led downstairs. Elijah was eager to try it out, and she constantly had to tell him no while we were with them. After a short tour of downstairs, we said our goodbyes to Jo and Elijah before I finished photographing the building. 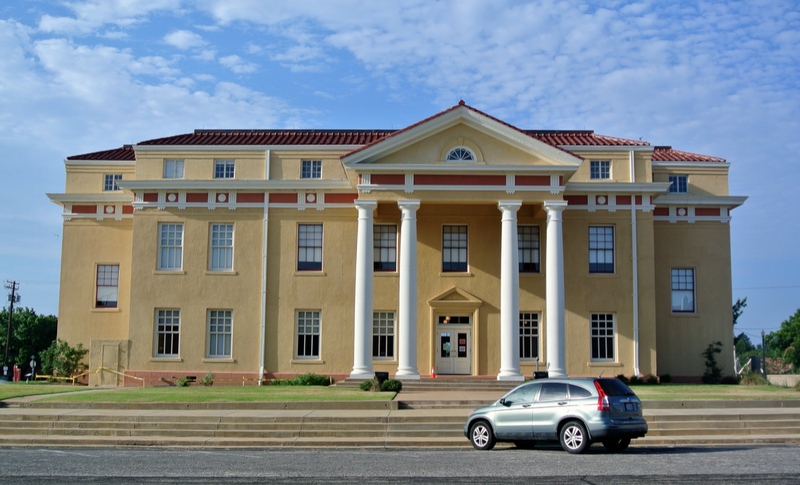 Next, we drove over to the current courthouse, a far less beautiful building. While there, I spotted Jo and Elijah again, walking inside. We guessed that she worked at the courthouse and had been sent over to the historic one in order to lock up. I’m very lucky to have caught her when I did. From Center, we headed back north, northwest to be exact, to Rusk County. The fairly large city of Henderson is the county seat. The courthouse there is nothing to be proud of. Nothing, certainly, compared to the building I’d seen before it. I did enjoy, however, a domineering statue of county namesake, Thomas Jefferson Rusk. 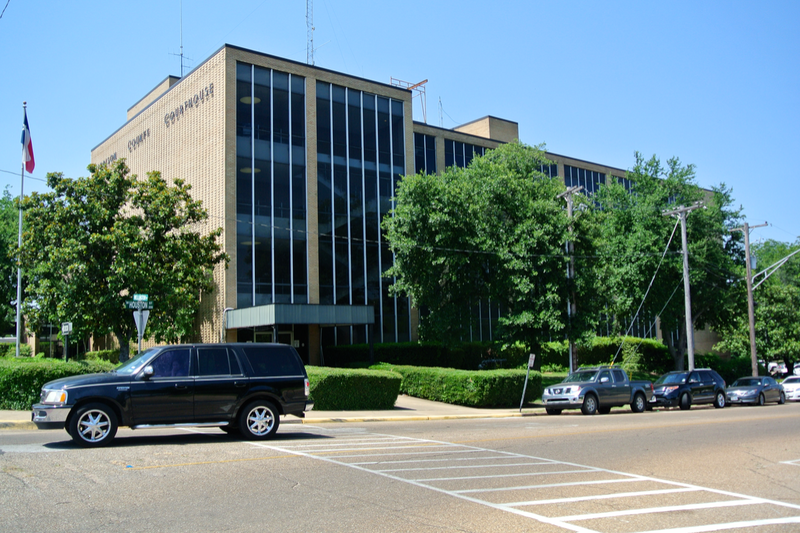 Following the pattern of many courthouses in the area, Rusk County’s is also not located on a public square, rather just off it. I made sure while in Henderson to take a few pictures of the square as well. Our night’s stop lay ahead of us, to the northeast in Gregg County. 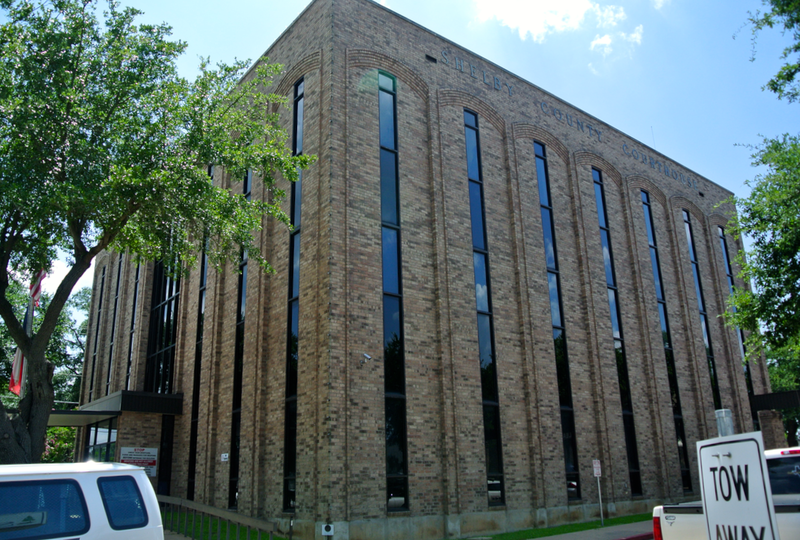 The city of Longview, while having a halfway-proper courthouse square, does not have a proper courthouse, at least by the standards I’ve seen in wide abundance across Texas. The towering 1932 Moderne courthouse in the city’s downtown district is tolerable enough, but a massive “modern block” of a 1982 addition is what draws away from the structure. 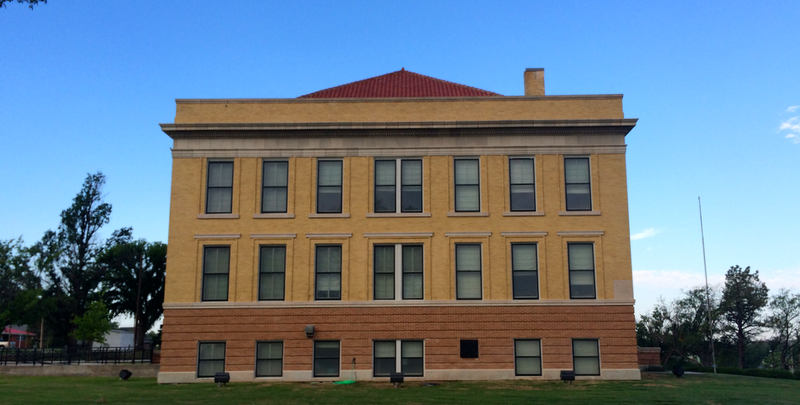 Upon first glance, this is no worse than the Potter County courthouse in Amarillo…but then one gets a better look. What on Earth! This is almost worse than the courthouse addition in Brazoria County! From downtown, we drove to our hotel and checked in. After a quick dinner, we went back for the night after a long day of courthousing. And what a day it was. Just for the record, Henley was born in Gilmer and grew up in Linden. My bad, the first result I got on his birthplace was Wikipedia and it said Linden. 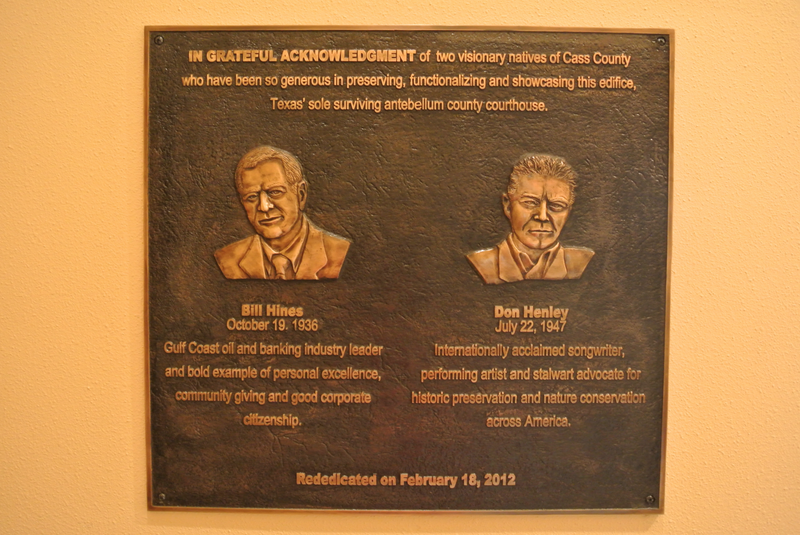 That, and seeing the plaque in the courthouse, just made me assume I suppose. Guess that’s what I get for trusting Wikipedia. Thanks for telling me this. I’ll change it.